The 2018 ERS congress in London was an enormous success with more than 1800 delegates from 86 countries in attendance. 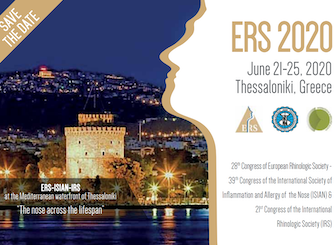 ERS 2020 in Thessaloniki will build on this success with even more on offer to delegates thanks to the enriching and inspiring scientific program from rhinologists, ENT surgeons, allergists, immunologists, skull base surgeons, facial plastic surgeons, allergists, primary care physicians, scientists and allied health professionals. The world-leading ERS rhinology congress is known for delivering engaging sessions by internationally-renowned experts. The goal of the event is to promote the exchange of ideas and information between colleagues and specialists from all over the world. We look forward to welcoming you to this four day event, packed with plenary sessions, symposia, instructional sessions, roundtable discussions, debates, workshops and much more!